When ordering your recycling bags from MK Council, you can now select the Town Hall as a place to collect them from. When collecting your sacks from the Town Hall, you must present your FS reference number, otherwise staff won't be able to give out the sacks. When you've ordered your sacks, they should be available from the Tuesday of the following week. 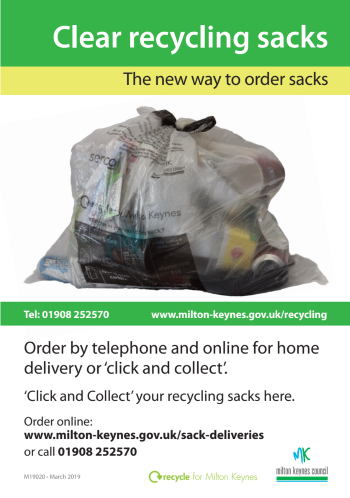 You can check eligibility and order sacks from MK Council via this link. From WGTC; "Following the objections raised by WGTC in regards to the licence for 24 hour trading at McDonalds Wolverton, informal discussions were held by WGTC, licensing and Kaizen, the Franchisee. 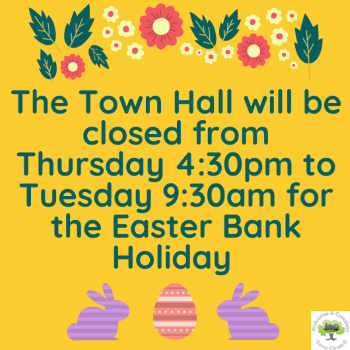 Following these, the Franchisee have now offered significant changes, which include sound reduction measures and signage to address some of these issues, and these have now been accepted and agreed"
12.04.19 - 16.04.19 - Church Street, Wolverton. Traffic signals (two-way) - 9:30 - 16:30. Bus services affected; 5, 6, 7, 14, 23, 30, 31, 33, 33A, 83, TB, 310. 12.04.19 - 16.04.19 - Old Wolverton Road, Old Wolverton. Road closure; 9:30 - 16:30. 12.04.19 - 16.04.19 - Timothys Close, Wolverton. Give & take - 24 hours. 16.04.19 - 18.04.19 - Church Street, Wolverton. Give & take - 9:30 - 15:30. Bus services affected; 5, 6, 7, 14, 23, 30, 31, 33, 33A, 83, TB, 310. 18.04.19 - Cambridge Street, Wolverton. Road closure - 9:30 - 16:30. 24.04.19 - 25.04.19 - Stratford Road, Wolverton Mill. Road closure - 9:30 - 16:30. Bus services affected: 6, 30, 31, 83, 606. For more information please go to MK Council's website via the link. Notice - Removal of the National Speed Limit Along Part of Stratford Road - Between Stony Stratford & Wolverton. MK Council have made the following Traffic Regulation Order under Sections 82(2) and 83(2) of the Road Traffic Regulation Act 1984. The effect of the made Orders will be to remove the existing national speed limit along part of Stratford Road, Wolverton (between V5 Great Monks Street and Queen Eleanor Street) and replace it with a 40mph speed restriction. The Orders have come into effect from 3rd December 2018. Additional provisions: There will be a soft closure at Crownhill Roundabout to allow access to crematorium. Did you know that the Wolverton Public Realm Design created in 2011 protects many of the design elements within Wolverton? Thanks to a local resident reporting this to us, we have now been in touch with Milton Keynes Council who have now halted the work that they have been undertaking across Wolverton. Works were originally scheduled to re-tarmac along Victoria Street which is part paved and part flagstone paved. The guide identifies where possible any works undertaken should look to retain or reinstate original features which strengthens Wolverton's identity. MKC will now look at their budget to see if they are able to secure funding to reinstate the remainder of the flagstone paving along Victoria street and WGTC are currently liaising with MKC to see what budget is available to undertake reinstating the remainder of the streets in the future. The Statement of Community Involvement (SCI) sets out how Milton Keynes Council will engage and consult with local communities and stakeholders on planning policy documents and planning applications within the Borough. The requirement to prepare a SCI was introduced in the Planning and Compulsory Purchase Act 2004. The Council’s existing SCI was adopted in March 2014. Following a change to the Town and Country Planning (Local Planning) (England) Regulations 2012 in April 2018, there is now a requirement to review this document every five years, starting from its adoption. We are therefore holding an eight-week period of public consultation to provide an opportunity for comments to be submitted on the draft SCI (2019). The consultation will commence on Monday 14 January 2019 and comments must be received no later than 5.00pm on Friday 8 March 2019. The consultation documents and supporting documents will be available at: https://www.milton-keynes.gov.uk/planning-and-building/planning-policy/statement-of-community-involvement-sci once the consultation is open. Please be advised that Milton Keynes Council has received a request to provide ‘no waiting at any time’ restrictions (double yellow lines) in Stacey Bushes, due to vehicles parking near to accesses to premises which are causing road safety concerns. The Council has reviewed this request and after careful consideration has decided to propose the introduction of ‘no waiting at any time’ restrictions at the junction (as illustrated on the attached plan). The proposed waiting restrictions will help to alleviate obstruction and enable a safer environment to be achieved throughout the above mentioned roads and encourage and facilitate safer pedestrian movements. It will also ensure free passage for refuse and emergency service vehicles. The Council intends to carry out informal consultation with local residents on 26th February 2019 for a period of 6 weeks. A letter will be sent to affected residents within the immediate area which will outline the concerns, proposal and invite them to comment. At the end of the consultation exercise the Council will consider all comments received and report back to you with the outcome and recommendations.